Consider this. Person A wants to say something to Person B. We will call the message that Person A wants to deliver ‘C’ and the means or mode by which they would like to pass it on ‘D’. So, in this way, Person A has several questions to ask themselves under each of these four main factors (A-D) to ensure that the Message C is effective. However, you will discover below that the vast majority of considerations are centred around Person B. First, Person A would need to consider who Person B is (the target audience) and where they stand in relation to their potential perception of Message C. For example, how deep is their existing knowledge of the Message C topic? Second, Person A would need to consider who they are and how they are perceived by Person B. What has the relationship been historically? As a key question- does Person B TRUST Person A at this moment? Does Person B respect and listen to Person A? How has Person A usually communicated and has this been effective or is it worth trying a different style for Mode D? The answers will influence both C and D.
Next it is important for Person A to review Message C and to ask what key message they wish to get across. Why does Person A want to get this message across? Is it for Person B to simply enjoy hearing about something new, for them to be inspired or for them to take action? What is the context of Message C? I.e. What other Mini-Message Cs are intentionally or unintentionally being put across by other verbal or non-verbal messaging? Do these Mini Message Cs also need to be addressed? Mode of message transportation (D) is influenced primarily by two factors: content and communication. Content considerations include: How long should the message be? As before, how much does Person B already know and, critically, how much do they need to know in order to be influenced in the way that Person A desires? How long is Person B likely to pay attention for? Is there a particular ‘call to action’ or incentive Person A can utilise to ensure the message is used or is useful to Person B in the near and long-term future? Is Message C something completely new to Person B or is it familiar? Is there a way it could be made more familiar, easier for Person B to consume and yet still exciting and interesting? Communication considerations include questioning what kinds of things Person B usually enjoys doing, do they find interesting to listen to or do they aspire to? Could Person A somehow incorporate that into the mode of messaging D? How does Person B usually like to consume new nuggets of information? Is it through word of mouth, reading in paper, or online, tablet or android phone, through music, images, or through another mode not yet thought of? Finally, when does Person B need to and want to hear this Message C? What is the best language (including tone of voice) to use? Of course, this is a very basic and traditional model of ONE-WAY communication. Person A could be a company or organisation; Person B could be their employees, investors or consumers and Message C could be a sustainability report or information about the implementation of a new company sustainability policy. Today, we know that TWO-WAY communication is the best way forward and Person B is in fact so important in this communication flow that in some cases their Voice E should be put before Person A. This means that there is an additional communication flow going back the other way that Person A should listen to. 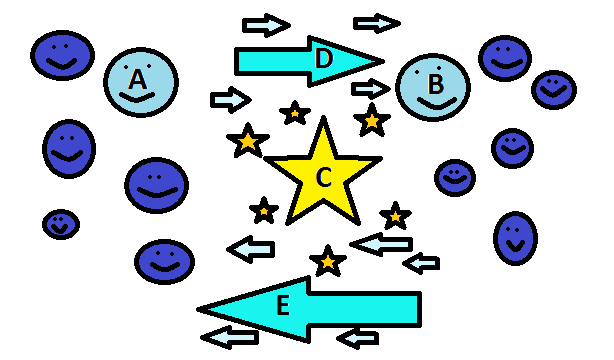 Person A would then need to think about what information they need to know from Person B and how best to obtain it, in a similar way to above. This could be via a workshop, survey or ongoing online polls and ongoing interactive feedback forums. We also now know that Person A must also consider what other Person As are doing, how they may have already influenced Person Bs and what is admirable or inadvisable about their Messaging C and Mode of messaging D. This is called benchmarking and is a further way to ensure effective messaging. Crucially, could the message be more effective by collaborating with other Person As and a few Person Bs? Is it worth spending the time, money, energy and effort needed to use several Modes D simultaneously? How will Person A know that the communication flow is going well and is successful? Yes there are multiple factors to consider, but that is why there is no harm in going back to basics (like in these accompanying images) and asking simple questions as above in order to clarify the most effective means of getting a message across. In summary, it is important to actively listen, collaboratively engage and, smile!